The "Box of Sin" is a nice device to use in Christian drama. This is a device I use every now and again in my dramas. 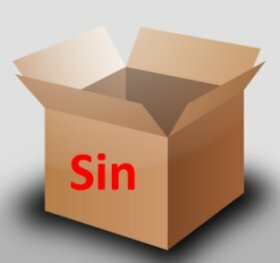 It is just a cardboard box that has the word “Sin” on it, but it is a great way to symbolize a person being lured into sin and becoming trapped as a result. You can use it for many different kinds of illustrations, such as the way I used it in the drama below. As with all of my dramas, feel free to use this one in any way you think will serve the body of Christ. I would appreciate a credit if you use the drama mostly as written. However, if you take the idea and make something relatively new, please don’t feel the need to credit me. John: (enjoying himself even more) This is incredible! I can’t believe how much fun this is! John: (Having the time of his life) This is amazing! Wow! John: (a bit frightened) Oh no. I’m really stuck. I can’t get out. Chris: (Turning to look at John) Sure. Chris: Woah….Wait a minute…I don’t think I want to get involved. Chris: That box is clearly labeled. You shouldn’t have gotten in there to begin with. Chris: Like I said, I don’t think I should get involved. I will give you some advice, though. John: (equally sarcastic) That’s really funny. Look, I am trapped in here. I don’t need a joke. I need to get out. Daniel: (Looks at John.) Sure. John: (Relieved) Thank you so much. I thought I might be stuck in there forever. You really saved my life! Daniel: No problem. I’ve been there. I know what it’s like. Want to talk about it?